credit: Artist Diane Brawarsky and A Growing Culture. The following article was submitted to the Greenhorns by Freya Yost. Freya is Director of Operations at Cloudburst Foundation, an Italian-based non-profit working closely with the Commonwealth to address climate change and meet the UN SDGs. Her background is in information science, specializing in areas of government information and policy, open source technologies, and digital rights tensions. After receiving an M.S. in Information Science from Pratt Institute, she started facilitating knowledge exchange between indigenous farmers in East Africa as Vice President of the organization A Growing Culture. She is a contributing writer at Global Voices, and has published with outlets including the Association for Progressive Communications, Peer-to-Peer Foundation, Truth-Out, and Shareable. She has articles in several peer-review journals including the International Federation of Library Associations and Institutions Journal and Indigenous Knowledge: Other Ways of Knowing. Cities currently hold more than half of the world’s population, and that number is increasing with rural to urban migrations. Decline of subsistence agriculture, a changing climate, and lack of opportunity are some of the main reasons for migration—all consequences relating to industrial agriculture, the predominant agricultural model in the world. We know how devastating the industrial model of agriculture is to the planet (draining natural resources and contributing ⅓ of greenhouse gas emissions) and to rural farming communities (destroying livelihoods and dominating markets with cash crops to be sent away to other countries) but we haven’t heard enough about how “big ag” erodes the resilience of cities. Rural areas are still the main producers of food and smallholder farmers account for 94% of the farms worldwide: there is more space to grow, raise livestock, process food, ecosystem diversity, and richer soils. In fact, the wellbeing of rural farming communities has incredible influence on the food security of urban populations—making the rural-urban relationship inextricably linked. If we allow industrial agriculture to continue to devastate rural farming communities it will only perpetuate hunger in cities. Rooftop gardens and urban agriculture are helping some inner-city communities get access to fresh food, but they are not feeding the world and certainly not the 8 million residents of New York City. When we evaluate alternative models to sustain growing cities we must support the potentially symbiotic relationship between urban and rural. This means that rural issues are urban issues, and vice versa. Family farmers already produce enough food to feed 10 billion people yet over 1.2 million New York City residents are food insecure and hunger is a grave, global reality. In this context our fixation with increasing crop yields seems rudimentary. The true challenge lies in improving access to food, social and economic disparity, excessive waste, and a centralized food-production system that prioritizes profit above the health and wellbeing of people. As an industrialised, wealthy and leading food producing nation, the US continues to have both hunger and health problems in all 50 states. In New York City alone, the income gap between rich and poor is the greatest in the country. New York City’s food insecurity rate is 11% higher than the national rate. These facts alone tell us how central inequality is to the food system and how, despite growing city populations, we need to continue to invest in rural, peri-urban environments around cities that can ultimately feed urban communities. Well functioning peri-urban areas act as a buffer that benefit both rural and urban areas, disrupting concentrated centers of inequality, and providing opportunities for communities. There are some powerful examples of cities that prioritized rural-urban food dynamics and established greatly-improved food security. Belo Horizonte, the capital of Minas Gerais state and Brazil’s sixth largest city, implemented a comprehensive set of programs aimed at providing access to food and support to small-scale family farming in surrounding rural areas. The Bolsa Família, a Brazilian national initiative based on the same objectives, reduced the number of food insecure people from 50 to 30 million. These initiatives adopted a policy based on the inalienable right of all citizens to sufficient, good quality food, not unsimilar to the values proposed by the food sovereignty movement. Food sovereignty, that declares the rights of all people to healthy, affordable, and culturally appropriate food and to control the mechanisms that govern the food system, is a movement pioneered by peasant groups like La Via Campesina—and its relevance is as urban as it is rural. It grew in part out of a fundamental flaw with the food-security approach; that is, that food security falls short of addressing the complexities of the entire system and all the socio-economic and cultural dimensions of the current food-production model. 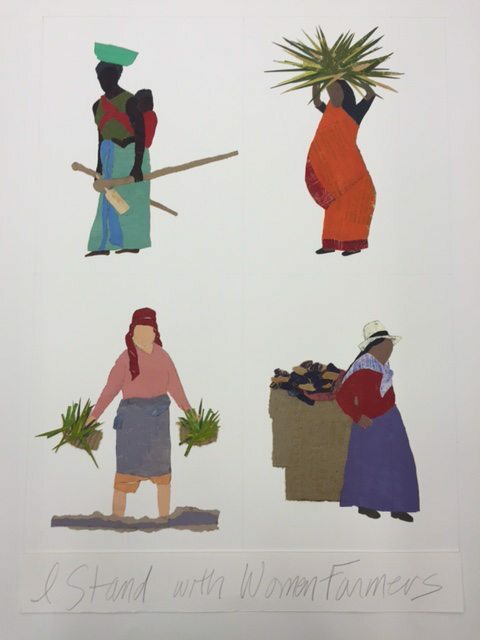 Food sovereignty is far reaching: from the family farmer to the World Bank, the inequalities of power that accompany gender, race, and social class, and violence against women. The values of food sovereignty have a lot to teach us. The movement moves beyond the overly emphasized “yield problem” to an array of deep-rooted, systemic issues—importantly inequality—that play an integral part of the food system. As we work to improve urban food systems we need to include rural, family farmers in the discussions and strategies. This is how we replace an unjust food system with a democratic one. kiss the ground: book and documentary about the hidden power of soil.